Its nearly Christmas and there are going to be many children asking for that 'puppy' for Christmas - But Stop Think - A puppy grows into a Dog and once Christmas is over - Was it reallly a GOOD IDEA! The puppy needs tolite training - its chewing all the presents - it needs walking - the kids are back at school and you are going back to working an eight hour day! So what can you do - go to the local rescue - which is FULL of abandoned - surrendered - mistreated - puppies BECAUSE people (could be like you) didn't THINK before getting the puppy of the LONG TERM COMMITTMENT that any pet needs. If you think of getting a puppy/dog - discuss the Breed - Your Hours of work - How many hours he will be left alone - holidays - who will look after your pup - Vet Bills - Insurance. But Most of all Can You really Be able to committ to Upto FIFTHTEEN YEARS of having a dog in your life! A Dog/Puppy IS FOR LIFE NOT JUST FOR CHRISTMAS. 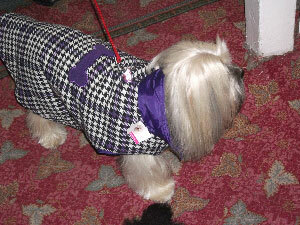 Finny in his mauve designer coat! French Bull-Dog in all her glory! Hilarious antics at the Charity Fashion Show held on the 27th November in aid of street dogs of Thailand. enjoyed the show as you can see from photos above. Over £300 was raised and a big thank you to all the people involved. Dog Fighting HAS TO STOP! 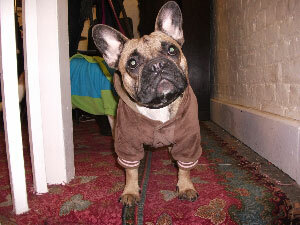 My pilot 'Dog Socialising Classes' have begun in South Westminster, an area I know but am unknown to the residents! I spent a few weeks before the classes commencing walking round and visiting the local Dog Area in St. Georges Square and Churchill Gardens Estate. Introducing myself to local residents and of course any four legged resident that I met, I found the idea of Socialising Classes regarding Training/Responsible Ownership was greeted with very positive reactions! I found a number of owners that had bull breeds - Benson a handsome Black Male Staffordshire Bull Terrier with a young mum - who said he was such a gentlemen EXCEPT HE PULLED on the lead and needed some help. Another extremely friendly boy was Trigger also a Puller and Jumped Up at everyone he saw. Both Young mums thought Classes were a great idea. Henessey the Beagle's owner had not heard about the classes and was in the dog run when it began - She was delighted as Henessey showed his 'behaviour techniques' by barking at everyone and running everywhere but back to his owner! Oscar the puppy who was obviously IN CHARGE - lovely nature but he did what Oscar wanted to do! Charley the Pug was there for a Beginners Course - and was a bit overwhelmed at first. The lesson went well and as it progressed more dog owners became involved. We discussed diet, visits to the vets, disruptive owners and aggressive pets, barking and walking to heel on the lead. During my lesson on Tuesday 30th, I met Luna a ten month german shepherd who had been attacked 3 times by dogs owned by irresponsible owners - and learned more about the 'dog attacks' and 'dog fighting' that was taking place in the area. I was given an area where 'dog fighting' was constantly taking place and am making an official report to the local authorities including the local police. (Just waiting for luna's owner to email me the full details). Part of my Project for South Westminster is to work with the community and local authorities to STOP DOG FIGHTING. - this ILLEAGAL INHUMANE - 'Its not the BREED Its the DEED' . Dogs are not only bred to fight - others are used as BAIT DOGS - Either way all the animals suffer horrendous injuries , a lot die from their injuries or are killed when they are no longer 'useful'!